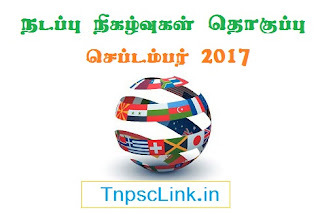 Tnpsc Daily Current Affairs Quiz and Online Mock Tests in September 2017 in Tamil, Date wise Current Affairs Model Questions and Answers, Quiz and Online Mock tests, Study Materials for TNPSC, TRB, TET, Government Examinations Banking and RRB Examinations. Covers International Affairs, National Affairs, State Affairs, Tamil Nadu Affairs, Environmental Affairs, Sports Affairs and Important days. Click the Links Below and get Download in PDF Format.